If you have seen the large new building going up just before the Belgrade Regional Health Center, it is the latest expansion of Belgrade Lakes Marine & Storage (BLM&S) (www.belgradelakesmarine.com) (207-495-2378). Demand for affordable covered RV(recreational vehicle)/Motorhome, travel trailer, campers, boat, automobile, storage has filled BLM&S to capacity the last several years resulting in the need for further expansion to continue to service customers. With the completion of the latest building, BLM&S has three buildings offering over 21,000 sq/ft of covered storage (Note – 9,000 sq/ft is down Farnham Road and not visible from the highway. The new building is 60 X 160 (9,600 sq/ft) feet with four large overhead doors 14 feet tall and 20 feet wide to accommodate the largest RV’s and longest travel trailers. Electrical connections and alarm service is available in the new building and will better serve owners who require their vehicles to trickle charge the battery during the winter. 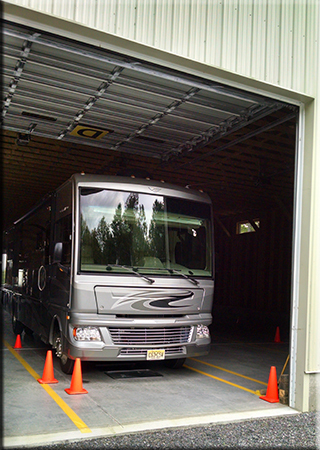 All buildings are fully enclosed with concrete floors and storage rates range from $33/foot for 10 months for the largest vehicles and those requiring electrical connections. Storing a typical 16 foot boat, protected from the winter and sun damage, typically only costs less than $50 a month. Recently, the owners, Tom & Dianne Dowd moved from Massachusetts to devote more time in “semi-retirement” to their property in Belgrade and devote more time to the expanding business. Tom had inherited the 180 acre Maplehurst Farm in 1966 and has tried to preserve the property, but at the same time looked for ways for it to pay its way. Even in 1966, boat storage was being provided in the original barn – a long-term tradition continues. Any questions on storage can be directed to 207-495-2378 or the website www.belgradelakesmarine.com.